There used to be a Royal Hunting Lodge by the ancient church of St Mary Magdalene, in the little Northamptonshire village of Geddington. There, on the night of 6th December 1290, the sombre party escorting the body of Queen Eleanor of Castile, beloved wife of King Edward I, rested on its journey to Westminster. Geddington had a history with Plantagenet kings and queens of England. The lodge, sometimes referred to as ‘the Palace of Geddington’, was often used by Henries II & III, and by John. Richard I (“the Lionheart”) apparently hosted King William of Scotland there. Edward and Eleanor themselves had stayed several times. So perhaps Geddington was a natural stopping point on the long trip south from the Nottinghamshire/Lincolnshire border, where Eleanor had died. 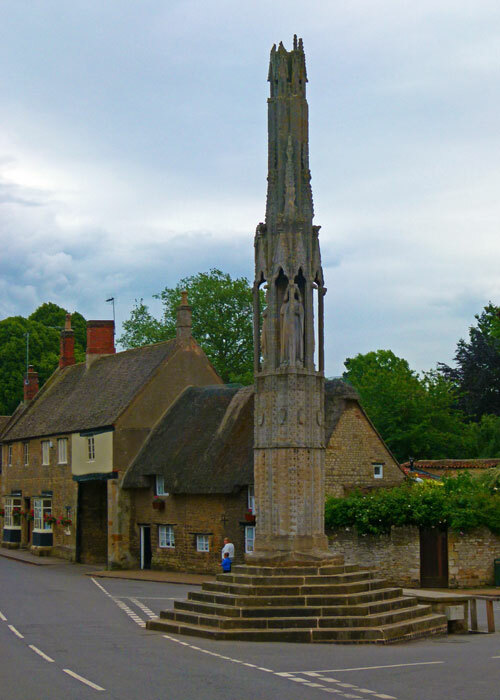 Eleanor’s Cross in Geddington stands just by the church, in the middle of the village, opposite a tempting-looking pub. It is one of just 3 survivors of the original 12 crosses that the grieving Edward ordered to be built at every point where his wife’s coffin had laid on its route home to London. The other two are at Hardingstone on the edge of Northampton, and at Waltham’s Cross in Hertfordshire. A replica of the one that once stood near present-day Trafalgar Square in London now sits outside Charing Cross Station. 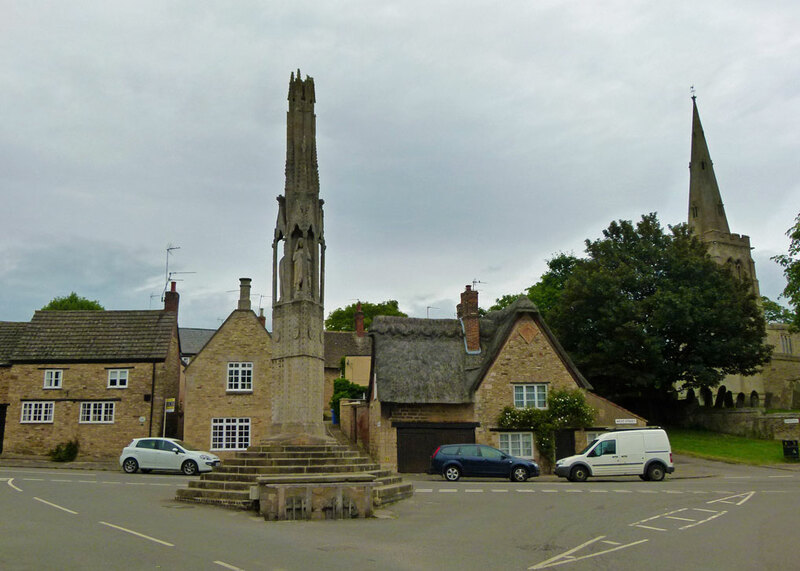 Geddington’s cross – it used to have one on top – is the best preserved of the 3 – made of limestone, highly decorated and finely engraved, it must be pretty close to the pinnacle of 13th century stone carving. Representations of Eleanor, sculpted from Caen stone, are set into niches, and sculpted shields show the arms of Castile, Leon, England and Ponthieu. The monument is 42 feet (almost 13 metres) high. 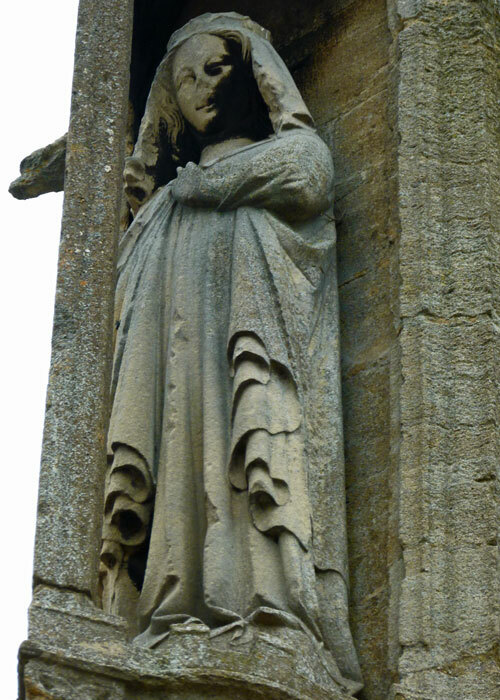 Go to A Bit About Britain’s article on Eleanor’s Cross, Hardingstone, to read a bit about the story of Edward and Eleanor, and the surviving cross at Hardingstone. You’ll find Geddington just off the A43, between Kettering and Corby. 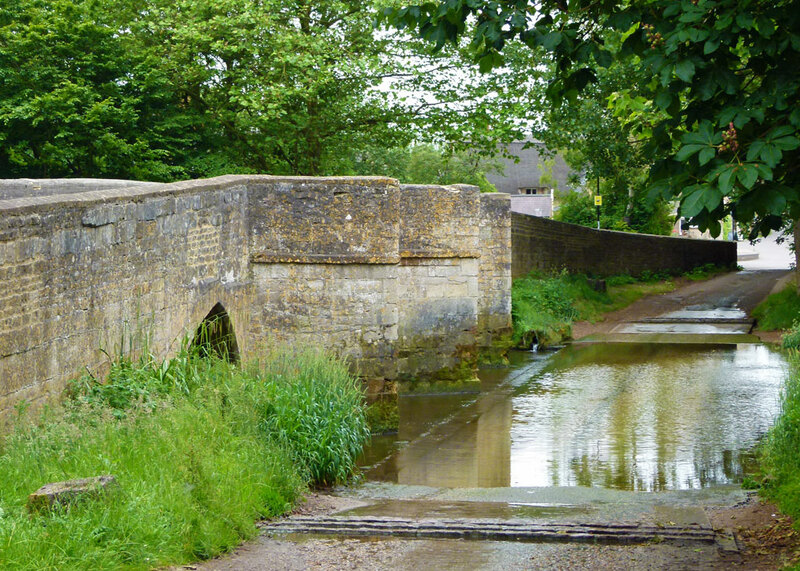 It’s a lovely village straddling the river Ise, with a super old bridge and ford as well as the Norman church, and it has a very good website, Geddington village website. Let me know what the pub’s like, won’t you? English history is simply AWESOME. I have to agree with you. Thanks for dropping by! Enchanting place, and truly a worthy destination to uncover! I did think of Charing Cross station’s cross as soon as I saw the photo! I didn’t know there was such a well preserved Eleanor cross anywhere – the replicas just aren’t as interesting. 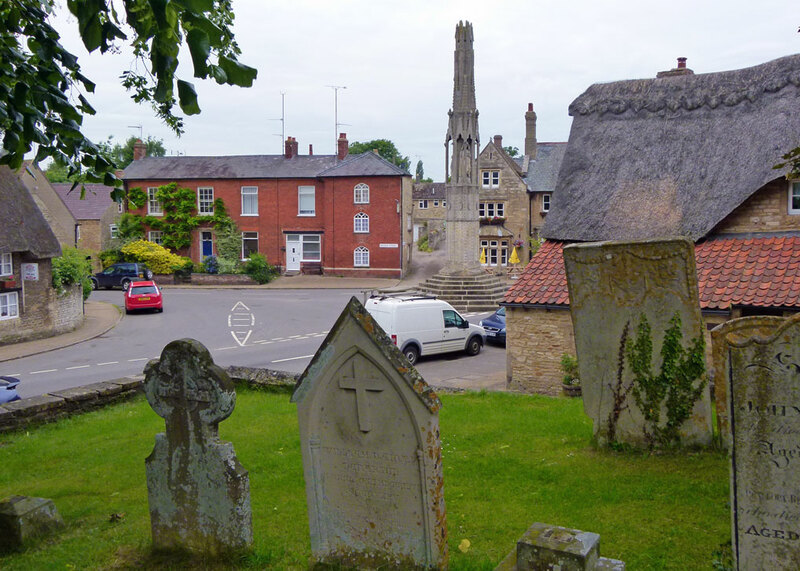 I have never found Northamptonshire an attractive county (sorry to anyone who lives there and reads this) but this village is really lovely so perhaps I have not managed to get quite enough off the beaten track there in the past. Oh, there’s LOADS to see in Northamptonshire! I know exactly what you mean about the industrial estates and car showrooms! The cross is impressive. Hopefully no harm comes to it. Interesting story about the crosses I had not heard of them before. It is a shame that so few of them remain.